Clarence Hoskins built the Buckeye in 1914, according to an article on New Street in the Beachcomber newspaper, Aug. 15, 1947. The article is unclear as whether or not that was the year he converted the farm house to a boarding house or when he added the second building, which stands to this day as the “Buckeye.” He built the Hollyhock cottage in 1921. Hoskins married Bertha Cadmes in 1929 and their son, Roy, was born the following year. Bertha, born in 1901, came to the resort community as a teenager employed by Gregory’s Four Gables and other lodging facilities. Then, as now, the resort town provided summer employment for young people, some of whom would meet their future spouse at the resort. After Clarence died in 1935, Bertha ran the hotel by herself. The physical strain of maintaining the properties while raising a young son was too much for one person, and she placed an ad in the newspaper for help. Homer Shatto, a Colebrook Township native, was in Los Angeles when he happened to read a help wanted ad for The Buckeye (his mother was sending the local newspaper to Homer so he could stay in touch with hometown news). Homer responded to the ad and headed back to Ohio, stopping in Las Vegas long enough to consider another job, a man who needed an assistant. Homer decided to continue heading east and thereby gave up the opportunity to meet and work for Howard Hughes. At the Buckeye, Homer put his many talents to good use. He was a painter, handyman and electrician who enjoyed solving problems with inventions. Homer won Bertha’s affections and they were married in 1942. Hyler Shatto, the son of Bertha and Homer, says that his father held several patents, including one for the notched device that raises and lowers the cooking surface on an outdoor charcoal grill. He was working on an electronic organ a year before someone else filed a patent, and he had the first radio in Colebrook Township and built it from a kit. Hyler, the couple’s only child, spent his summers at The Buckeye and attempted to migrate south at the start of school, but he and the kindergarten that was in the town where his parents wintered did not get along. Hyler was allowed to return to Geneva and complete his education there. While living in West Palm Beach, Fla., Homer Shatto became interested in purchasing a hot dog stand that was near a heavily-traveled bridge. He even had a name for it: Miramar, “to see the sea” in Spanish. Bertha felt that they had enough to keep them busy without taking on a distant restaurant. Homer didn’t give up completely on his dream, however. Back in GOTL, he got the idea of building a small lodging facility of six units next to The Buckeye. Homer and Bertha divorced after 10 years of marriage. Bertha continued to run The Buckeye with help from her son Roy, Hyler and the hired staff. Roy went to work for Geneva’s True Temper plant right out of high school, leaving Hyler to take care of many of the chores around the hotel. By the time he was 18, Hyler was shouldering much of the work, from checking in guests to mopping all three floors. 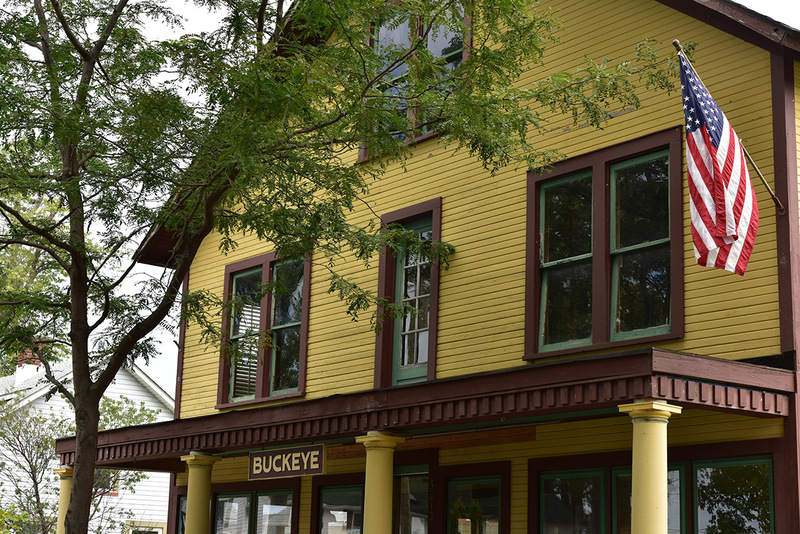 By the early 1960s, The Buckeye had become an economy lodging option. “We got the good, the bad and the ugly,” Hyler says. Guests paid from $4.50 to $5.50 a night per person in the years following World War II. There was a shared bathroom on first and second floors. The first floor was for the men only; the second for woman only. An Italian workman from Ashtabula Harbor did the black-and-white tile work for the showers, which were scrubbed down and disinfected daily. The lodging was no-frills – double beds in most rooms; a small corner sink; thin, wood walls separating the rooms and providing little in way of sound dampening; no air conditioning and minimal lighting. Nevertheless, because most guests went to the beach and partied late, it provided the essentials – a place to sleep off the effects of the partying and take a shower. The rowdy guests were assigned to the building that still stands; the more cooperative and sedate guests stayed in the old farmhouse. The farmhouse burned down in the 1940s and the conflagration threated The Buckeye. Bryon Robertson, who owns the building, says he found evidence of the scorching when renovating the north side of the structure, now an antique store. The Buckeye operated until 1966, when it was sold to Loril L’Hommedieu, who owned the Play Tog Shop at the corner of The Strip and New Street. He had plans to make it into a restaurant and hotel, but the plans never materialized. Byron Robertson resides in The Buckeye and is slowly converting it to a lodging facility. The gray house between The Buckeye and Miramar is where Hyler grew up. The basement of the house was where the hired help did the laundry for The Buckeye. Hyler Shatto operates Allen Court, which was built by his late father-in-law. He has kind words for his parents, who, even though they did not stay together, found success as individuals. Homer Shatto, in his latter years, sold real estate and returned to Colebrook. A diabetic, he worked on inventions and patents until his death. One pervasive legend of The Buckeye is that the third story of the extant building, during the 1920s, was used as a speakeasy during Prohibition (1920-1933) and that the hooch was stored in the wooden water tower behind the building. The Redwing, according to the legend, was used to haul illegal liquor from Canada to GOTL. But the dates don’t align; by the time Prohibition was in force, Charles Hoskins was running the Redwing as a fishing boat and he would have risked the loss of his livelihood had he been caught. Further, Hyler Shatto says that his mother never would have allowed that kind of activity in her hotel. “She was a lady; she would not have put up with it,” Hyler says. Eleven years after divorcing Homer, Sept. 19, 1963, Bertha married Capt. Charles Hoskins, her first husband’s brother. He was 71, she was 61. It had been an emotionally difficult journey to the altar for Charles. After the death of his first wife, Marvet, in 1961, he became engaged to Beatrice A Higgins. A widow for 38 years, Beatrice agreed to marry Charles and even set the wedding date, Nov. 10, 1962. But she died within weeks of her planned wedding day. The couple moved to Erie, Pa., where Charles was active in his church and continued to following the commercial fishing industry and the fate of its boats and captains. Bertha became a widow for the second time in 1980. She died in 2000 and is buried in Mount Pleasant Cemetery, Geneva, between her son, Roy, and first husband. Charles is buried in Erie, Pa.